DURHAM, N.C., Sporting Alert — Freshman Marvin Bagley III had a double-double with 24 points and 10 rebounds as No. 1 Duke beat Utah Valley 99-69 and coach Mike Krzyzewski became the first men’s Division I coach to win 1,000 games at one school. 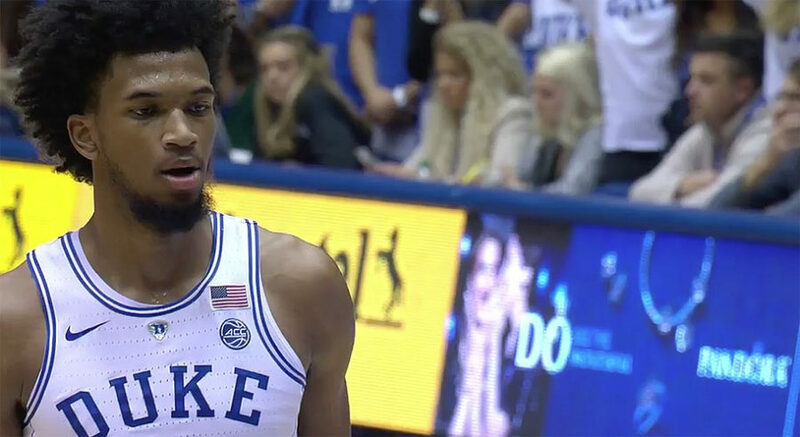 Bagley III, who shot 11 of 17 from the floor, scored 14 of his points in a very busy first half where the Blue Devils (2-0), who led 48-33 at halftime after a slow start. Senior guard Grayson Allen picked up the pace from a slow start to added 18 points, while three freshmen contributed significantly in the win. Gary Trent Jr. finished with 17 points, Trevon Duval ended with 15 points, 12 assists and three steals and Wendell Carter Jr. had 12 points, four blocks and three steals for Duke, which took control of the contest midway through the first half with a 27-8 run. Commenting on freshman Bagley III, Allen said: “He’s so good at going and getting offensive rebounds, especially his own shots. “He just gets up quick so you don’t even know, but he’ll get three offensive rebounds on one possession. Having a weapon like that is great. It gives us a lot of confidence as shooters when you see that guy down there that, if you happen to miss, he’ll probably go get it. Akolda Manyang tallied 17 points and 12 rebounds to lead the way for Utah Valley (0-2), who also lost to No. 5 Kentucky on Friday night. Kenneth Ogbe, Kenneth scored 13 points, Brandon Randolph had 12 and Conner Toolson finished with 11 for the Wolverines, who struggled with turnovers again and were punished almost everytime. Meanwhile, Duke also improved its NCAA-best non-conference home winning streak to 134 games. Next up for the Blue Devils is a date with No. 2 Michigan State in the Champions Classic on Tuesday night in Chicago. Utah Valley will visit Idaho State on Tuesday night as well.